Sitting with a hot bowl of alphabet soup, who among us hasn’t tried to string words together from the noodle letters floating within? That urge struck me recently when I opened a box of Eden Organic Vegetable Alphabets noodles and found the letters forming words in lovely, earthy hues of spinach, carrot, beet and annatto. These noodles were begging to be incorporated into craft projects! Thanksgiving place cards and whimsical letter art are two craft ideas using alphabet noodles that are quick, easy, inexpensive and kid-friendly! Keep reading for instructions! To make a Thanksgiving place card, cut cardstock to size from a scrap, fold it in half to create a tent shape, then trim the bottom with scalloped scissors. 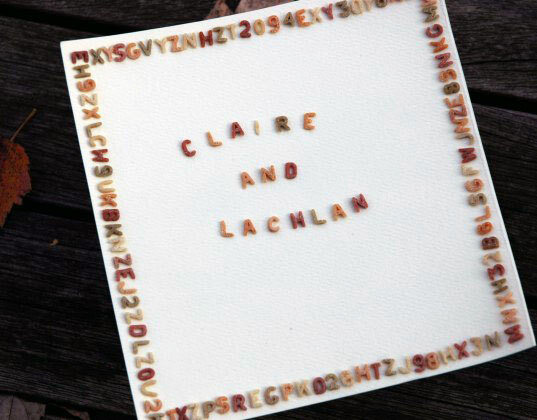 Temporarily flatten the cardstock by unfolding it, then apply glue and affix noodles to spell out the names of your dinner guests. Add a dried leaf to the corner of the place card to give it more texture and color. Allow to dry overnight, then re-fold the card into its tent shape. Ask your child to help you spell out his name or favorite words, and place the layout of letters on the table next to the cardstock, so you’ll have your design ready to transfer once you’ve applied the glue. Let the glue dry overnight, then tape a loop of string to the back and hang from a hook or nail. Enjoy! Sitting with a hot bowl of alphabet soup, who among us hasn't tried to string words together from the noodle letters floating within? That urge struck me recently when I opened a box of Eden Organic Vegetable Alphabets noodles and found the letters forming words in lovely, earthy hues of spinach, carrot, beet and annatto. These noodles were begging to be incorporated into craft projects! Thanksgiving place cards and whimsical letter art are two craft ideas using alphabet noodles that are quick, easy, inexpensive and kid-friendly! Keep reading for instructions!